Whether you are an experienced Labrador owner, about to bring your Lab home, still looking for the perfect dog or simply in love with the greatest breed of them all then the Labrador Retriever Guide is for you! 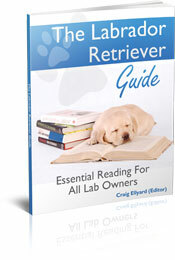 Everything A Lab Owner Needs To Know! Packed with information, hints, tips and advice this labrador retriever ebook is a one -stop owners manual for all Labrador lovers. From finding a breeder to Lab proofing your home to training your new (or old) dog - everything you need is in this book. * Great tips and techniques on training your Lab so that you are the pack leader and not the dog! * And so much more !!!!! The book runs to about 80 pages and along with great information contains loads of great new photos of the most adorable Labs ever! Contents include chapters on choosing your Lab, bringing her home, caring, feeding and training her and looking after her from puppy to senior dog - along with lots of great information on Labrador health and welfare. Because it is an ebook you can be reading the Labrador Retriever Guide within minutes and the instant download from the Paypal secure servers offers a risk free, and instant, transaction. You don't have to have a Paypal account to buy and can use any credit card to pay through their secure servers. You will need Adobe Reader (the latest version is recommended) installed on your computer in order to open and read this ebook. Most computers have this software already installed but you can also get Adobe Reader here (a new window will open so you can download it without leaving this page). You will be taken to the ebook download page directly after payment. Download instructions will also be sent to your inbox from the authors personal email address.